It is an agate with color bands varying from red to orange brown hues. 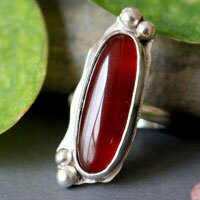 Red agate would be efficient for all problems linked to blood and blood circulation. It would relieve pains provoked by burning. It would strengthen the work of kidneys and would avoid infections. Red agate also has the same properties than the agate in general.